Being British I share Gibbon’s interest in events in Britain, but in reality what was going on elsewhere was a lot more significant. Indeed Carausius may well have calculated that he stood a good chance of getting away with his entire province larceny scheme because the emperors would be otherwise engaged elsewhere. And at the time it would have been hard to disagree with him. At any time the Romans could face barbarians pouring across the Rhine or the Danube. There was always a threat from Persia. And discontent in Egypt was due to reignite at any time. But Diocletian was very much on the case. When Gaul was invaded once again by the Alemanni the response was not rapid but it was to prove highly effective. It may well have been the need to ensure the safety of Gaul that led directly to the appointment of Constantius as Ceasar with command of his own army and with a brief to stabilise the situation. This was easier said than done, and there were some moments of severe danger. At one point Constantius himself was caught unawares by a large group of Alemanni who outnumbered him and forced him to retreat to the city of Langres. The barbarians were close behind and quickly laid siege. The attack was so rapid and so ferocious that the city gates had to be closed before the emperor himself was inside and he had to scale the walls with a rope. But in the event the barbarians had overplayed their hand. Roman troops nearby came to the emperor’s rescue by the end of the same day and turned what could have been a humiliating defeat into a Roman victory. But despite this sticky moment and some others, the overall campaign was a success and the barbarians were not only defeated but large numbers of them were captured and obliged to remain within the empire employed as menial labourers. The fortifications along the borders of Germany were strengthened. The old policy of fomenting discord was deployed and the Romans were treated to the spectacle of civil war amongst the Germans while the empire enjoyed internal peace. The barbarians outside the empire were killing one another, and the barbarians within it were driving cattle to market and tending to crops in the field. Fortifications stretched from the North Sea to the Black Sea. The Romans could once again feel both secure and superior. It was the first time they had been able to do so for many years. Captives from the campaign of Constantius were not the only barbarians now inside the empire’s borders. Groups that sought refuge were also granted the right to stay and allowed to keep their own forms of government. The obvious risks of this policy were not considered. In the East Diocletian created three huge armories at Antioch, Emesa and Damascus, part of an extensive military build up. The main enemy in the region was Persia, but there was also Egypt. Egypt had had a taste of life outside the Roman Empire during the career of Zenobia. The experience had obviously been a positive one, and it isn’t hard to see why. The fertile soil of Egypt made it the empire’s bread basket, which was great for the empire but distinctly less so for the Egyptians. Bread and circuses in Rome translated to a large tax burden in Egypt. The revolt of Ferminus in the reign of Aurelian had been foolhardy but it originated from very real grievances. I must just follow one of Gibbon’s digressions. One of Diocletian’s edicts in Egypt outlawed alchemy and called for the destruction of all alchemical texts. If you read the history books review blog or follow me on Twitter you’ll know that online I use the name History Scientist. I am specifically a chemist, and as you might expect I am interested in the history of chemistry. This edict of Diocletian is one of the earliest references to applied chemistry. The transmutation of base metals into gold was for centuries one of the major goals of chemists and it seems quite likely that a lot of the early development of lab techniques may well have been in Egypt. It is a shame that Diocletian caused so many texts to be destroyed. I would love to be able to read something that old and see how it compares with the way I work today. But the Egyptian obsession with the production of gold may well have had political and economic origins. The extensive military commitments of Diocletian’s reign had to be paid for somehow and the long suffering Egyptian’s interest in the production of gold may well have proceeded pretty directly from the fact that Diocletian had taken all of theirs. The motivation behind the ban on alchemy isn’t entirely clear. One would have thought that Diocletian would have been quite keen on a project that might make his subjects capable of paying even more taxes. Perhaps it was simply, as Gibbon proposes, that he didn’t want them wasting their time on a fruitless exercise. He may have been projecting his own enlightenment values onto Diocletian there. In any case, alchemy was to survive Diocletian’s purge and would go on to become the basis for one of the big three of the modern sciences. But before Egypt caused any trouble there was another and unexpected crisis in the south. A confederacy of five Moorish tribes invaded the western Roman provinces of Africa. This was a straight forward military problem requiring a rapid response by a courageous general. Maximian was in charge of this portion of the empire and so was on hand and was in his element. His counter attack was so effective that he drove the Moors from the Atlas mountains, which they had previously used as their supposedly impregnable base. Maximian was definitely a handy man to have around for certain types of problem. Next Egypt broke out in revolt. Diocletian was the Augustus in this region, and he handled this in his own very characteristic way. The city of Alexandria was surrounded and the aqueducts cut off. And then he barricaded himself in position and waited for thirst and hunger to deal with his opponents. It was unspectacular, but it was effective. After eight months the city gave in, and Diocletian engaged in severe reprisals against his opponents. Thousands were killed. Alexandria got off relatively lightly. Two other cities, Busiris and Coptos joined the long list of cities completely destroyed by the Romans. Diocletian was an able man and there is much about him that can be admired. But Roman emperors were on the whole a brutal lot, and Diocletian was just as much a brutal tyrant as the rest of them. He was also imperious. The Egyptian rebels had allies beyond the border of the empire in Ethiopia and across the Red Sea. To block this support Diocletian moved a tribe from Libya to the upper Nile to form a barrier. The decline of the empire may have set in much earlier, but to see Diocletian moving whole peoples half way across a continent and destroying cities out of pure anger, you have to say it doesn’t look that decayed just yet. It certainly wasn’t an empire that was any longer going to take a tweak to the nose lying down. There was still the outstanding matter of the punishment of Persia for its treatment of Valerian. And there was a stick to hand with which to beat them. The Persian war which led to the downfall of Valerian had been caused by the extension of Persian influence into Armenia. The Romans had failed to prevent the Persians gaining effective control of Armenia via a coup that had handed the throne to a Persian supported usurper. But they had managed to get hold of the infant Tiridates, the legitimate king of Armenia. He was now a full grown man. It was time to reassert his rights. Tiridates had grown up to be strong able and bold, just the kind of hero needed to liberate Armenia. He returned triumphantly to his native country – which he had never before been able to visit – and was instantly hailed as a liberator. Inspired by his leadership, the Armenians rose up against the hated Persians. The monotheistic Persians had intolerantly tried to impose their religion on the reluctant Armenians. They had destroyed the people’s temples and statues and smashed their sacred images of the Sun and the Moon. They had also desecrated the sanctity of the holy mountain of Bagavan by erecting an alter that continually burnt with an impious fire devoted to Hormuzd. The country’s gods had been profaned as well as its legitimate leaders killed or exiled. But rescue had come in the form of the youth and strength of Tiridates allied with the wise head of Artavasdes, the very general who had saved him as a child. Wherever they went the Persians were thrown out, and a restored Armenian monarchy proclaimed. In addition a nobleman called Otas came forward who had, it turned out, been looking after the sister and the treasure of Tiridates all along. Tiridates might have expected and certainly would have hoped to find support among the Armenians in his bid to regain his throne. He also picked up an unexpected and quite extraordinary ally. This was a man called Mamgo. He led a tribe of Scythians who had recently incurred the displeasure of the emperor of China. He had taken refuge with the Persians. This had given the Persians a diplomatic headache when the Chinese demanded his head. The Persians solved the problem by allocating a chunk of Armenia to him, which conveniently was not technically part of the Persian Empire – with the explanation to the Chinese emperor that exile to the West was a fate worse than death. It is often debated what the Chinese and the Romans knew of one another. Whatever the truth of that one, it is certain that there were some people around who knew both very well. The Persians had no doubt intended Mamgo as a defensive buffer. But when the war broke out between the Persians and the Armenians, Mamgo weighed up the pros and cons and threw his weight in with Tiridates. It all sounds great doesn’t it. Imagine the Hollywood version. I like a good story and I usually give history the benefit of the doubt. So I’d like to think that that is how it all happened. It does come from a highly partial Armenian source though, and doesn’t mention that Tiridates’ great heroism was aided hugely by dynastic problems in Persia itself. Once the Persians sorted themselves out and fell in behind the rule of Narses, the reconquest of Armenia was rapid and straightforward. Tiridates was back on the boat to Rome. Rome could not allow such an important ally to be humiliated and the Caesar Galarius set out to restore him to the throne. The strategy was a direct invasion of Persia. There were two indecisive battles but in a third the Romans were decisively defeated. The blame for the defeat was laid firmly at the feet of Galarius himself. He had, in the heat of the battle, led a charge aimed at capturing the king of Persia. But he made his attempt with too few men and this turned the defeat into a rout. When I say blamed, I mean blamed. 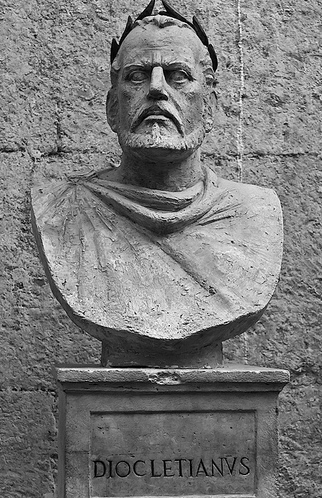 Diocletian held his junior emperor personally responsible, and in public. In fact he was obliged to follow after the chariot of the Augustus on foot for over a mile before Diocletian would even talk to him. This was another great advantage of the tetrarchy system, from Diocletian’s point of view at least. Military set backs could be spun as down to the shortcomings of the emperors that were lower down the food chain. This did not in any way prevent credit being taken by the man in charge when things went well. Don’t you just love autocratic despotism, eh? Incidentally, some people always manage to get a good press. Tiridates was pursued from the field by a large group of horsemen. He would have been killed or captured with disastrous consequences, but he managed to leap into the Euphrates and swim across it in full armour to safety. What a man. The shame of Galerius cannot have been too deep seated because he was back in charge of another Roman army the next year in a further attack on Persia. Gibbon excuses the defeat in the plains of Mesopotamia on the grounds that the terrain did not suit the Roman way of fighting. Level ground favours cavalry and discriminates against infantry. He may well have a point because this time Galerius chose to attack via hilly terrain and was much more successful. He spied out the enemy camp personally and led a daring night attack. This took Narses by surprise and led to the complete defeat of the Persians. An immense amount of treasure was captured. Narses did particularly badly personally losing wives, sisters and children. These were treated with great respect by Galerius. It was noble spirited and generous behaviour enabling me to end this week’s episode on a high note. Once again I should draw your attention to the fact that the modern view of the order of events is a bit different to that of Gibbon. I have a feeling from a close reading of this chapter that Gibbon himself was a bit hazy as to the chronology and settled on telling a good story. I have maintained this vagueness about dates. Next week I’ll cover the rest of the reign of Diocletian but I have decided to skip over the peace negotiations with Persia. Gibbon gets the geography so wrong it is too embarrassing frankly.